Anatomy of the hair follicle. The histologic features of the hair follicle change continuously and considerably during the hair growth cycle, thereby making follicular anatomy an even more complex entity. The size of hair follicles varies considerably during the existence of the follicles. Anagen hairs vary in size from large terminal hairs, such as those on the scalp, to the small vellus hairs that cover almost the entire glabrous skin (except palms and soles). Under hormonal influences, the vellus hair follicles in the male beard area usually thicken and darken at puberty. In predisposed individuals, the terminal hairs on the adult scalp can undergo involutional miniaturization (become vellus). Although vellus hairs greatly outnumber terminal hairs, the latter are more important. Therefore, the discussion of hair anatomy in this article focuses on terminal hairs. The follicular life cycle can be divided into 3 phases: anagen, catagen, and telogen. The anagen phase is the phase of active growth, the catagen phase marks follicular regression, and the telogen phase represents a resting period. In the human scalp, the anagen phase lasts approximately 3-4 years, while the catagen phase lasts about 2-3 weeks, and the telogen phase lasts approximately 3 months. Approximately 84% of scalp hairs are in the anagen phase, 1-2% are in the catagen phase, and 10-15% are in the telogen phase. The bulb encompasses the dermal papilla and the hair matrix. The dermal papilla consists of an egg-shaped accumulation of mesenchymal cells surrounded by ground substance that is rich in acid mucopolysaccharides (AMPs). The papilla protrudes into the hair bulb and is responsible for instigating and directing hair growth. Because of the abundance of AMPs, the dermal papilla stains positively with Alcian blue and metachromatically with toluidine blue. The lower part of the dermal papilla is connected to the fibrous root sheet. The hair matrix surrounds the top and sides of the dermal papilla. In darkly pigmented individuals, melanin can be found in abundance within the melanophages of the dermal papilla. The hair matrix is the actively growing portion of the follicle consisting of a collection of epidermal cells that rapidly divide, move upward, and give rise to the hair shaft and the internal root sheath. The cells of the hair matrix have vesicular nuclei and deeply basophilic cytoplasm. Melanocytes can be found between the basal cells of the hair matrix. Melanin is transferred from these melanocytes into the cells that make up the hair shaft and is responsible for the color of the hair according to its quantity. The hair matrix cells give rise to 6 different types of cells that make up the different layers of the hair shaft and the inner root sheath. The inner root sheath (IRS) is closely apposed to the hair shaft, and, because the sheath contains no pigment, it can easily be distinguished from the hair shaft. The IRS coats and supports the hair shaft up to the level of the isthmus, at which it breaks down and exfoliates in the infundibular space. The IRS consists of 3 concentric cell layers. The layers keratinize by forming trichohyalin granules; this is unlike the hair shaft, which undergoes trichilemmal keratinization. The outermost layer of the IRS (Henle layer) keratinizes first because it is lowest in the hair follicle. The cells of the innermost layer (IRS cuticle) point downward and inward and interconnect with the cells of the hair cuticle. These 2 cuticles are completely integrated and keratinize after the Henle layer. The middle layer (Huxley layer) keratinizes after the IRS cuticle and the hair cuticle. The 3 layers are distinct just above the dermal papilla. However, they keratinize relatively low in the hair follicle and are indistinguishable at higher levels, where they function as a single unit covering the hair shaft. The IRS stains deeply with toluidine blue because of the presence of the amino acid citrulline. The hair shaft consists of 3 layers. The outermost layer of the hair shaft (cuticle) consists of overlapping cells that are arranged like shingles. They point outward and upward and interlock with the IRS cuticle, which leads to a firm attachment between the hair shaft and the IRS. As a result, they move upward in the follicular canal as a single unit. The middle layer of the hair shaft (hair cortex) constitutes the bulk of the hair and consists of cells that keratinize gradually as they move upward from the hair matrix. Unlike the IRS, which keratinizes by forming trichohyalin granules (soft keratin), the hair cortex cells keratinize without forming granules (the aforementioned trichilemmal keratinization). The keratin produced is termed hard keratin. The innermost layer (medulla) is frequently difficult to visualize. Routine light microscopy is typically used to visualize this layer, because the layer is discontinuous in many cases and is often completely absent. Medullary cells contain glycogen-rich vacuoles and medullary granules, which contain citrulline (similar to the cells of the IRS). The outer root sheath (ORS) covers the IRS as it extends upward from the matrix cells at the lower end of the hair bulb to the entrance of the sebaceous gland duct. The ORS is thinnest at the level of the bulb and thickest in the middle portion of the hair follicle. The ORS cells contain clear, vacuolated cytoplasm because of the presence of large amounts of glycogen. The ORS does not keratinize below the level of the isthmus (in contrast to the IRS). However, at the level of the isthmus where the IRS disintegrates, the ORS keratinizes without forming granules (trichilemmal keratinization), which is similar to the keratinization of the hair cortex. At the level of the infundibulum, keratinization of the ORS changes to normal epidermal keratinization with formation of the granular cell layer and stratum corneum. The basal cell layer of the ORS contains inactive amelanotic melanocytes; in contrast, the surface epidermis that lines the infundibulum contains active pigmented melanocytes. The inactive melanocytes in the basal cell layer can become melanin-producing cells after skin injury (eg, chemical peels, laser resurfacing, dermabrasion). They proliferate and migrate toward the regenerating upper portion of the ORS and the epidermis. The glossy (vitreous) layer is the eosinophilic acellular zone surrounding the ORS. This layer is continuous with the epidermal basement membrane and is similarly periodic-acid-Schiff (PAS) positive and diastase resistant. Unlike the epidermal basement membrane, the glossy layer is much thicker and is visible with routine stains. During the catagen phase, the vitreous layer becomes much thicker and corrugated, which is a distinguishing feature of catagen phase hairs. The fibrous root sheath is the outermost layer of the hair follicle and surrounds the vitreous layer. It consists of thickened collagen bundles that coat the entire hair follicle. The root sheath is continuous with the dermal papilla at its lower end and with the papillary dermis above it. The suprabulb region extends from the hair bulb to the isthmus and consists of components of the hair shaft, IRS, ORS, vitreous layer, and fibrous root sheath. 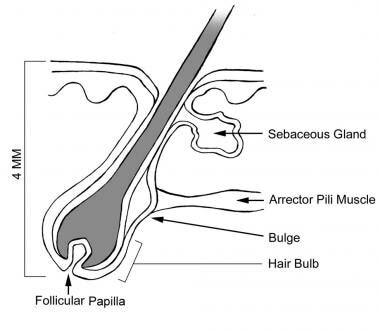 The isthmus is the shortened segment of the hair follicle, extending from the attachment of the erector pili muscle (bulge region) into the entrance of the sebaceous gland duct. At this level, the IRS fragments and exfoliates, and the ORS is fully keratinized (trichilemmal keratinization). The bulge region is difficult to visualize on routine stains. It is made up of several protrusions and crests and contains cells with pluripotent capabilities. The infundibulum is the upper portion of the hair follicle, above the entry of the sebaceous duct. Surface epidermis lines the infundibulum. Although the factors are largely unknown, active hair growth (ie, the anagen phase) halts, and the catagen phase begins. A period of 2-3 weeks is required for the transition to occur. During this next phase, the hair bulb becomes keratinized (club hair) and is pushed upward to the surface by a column of epithelial cells. This column of cells is characteristically thick and corrugated in this stage, eventually shortening progressively from its lower end. It is reduced to a small, nipplelike configuration termed the secondary follicular germ. In this stage, the dermal papilla moves upward, following the epithelial sac. Murphy GF. Histology of the skin. Elder DE, ed. Lever's Histopathology of the Skin. 8th ed. Philadelphia, Pa: Lippincott-Raven; 1997. 5-50. Sperling LC. Hair anatomy for the clinician. J Am Acad Dermatol. 1991 Jul. 25(1 Pt 1):1-17. [Medline]. Tiede S, Kloepper JE, Bodo E, et al. Hair follicle stem cells: walking the maze. Eur J Cell Biol. 2007 Jul. 86(7):355-76. [Medline]. Umeda-Ikawa A, Shimokawa I, Doi K. Time-course expression profiles of hair cycle-associated genes in male mini rats after depilation of telogen-phase hairs. Int J Mol Sci. 2009 Apr 28. 10(5):1967-77. [Medline]. [Full Text].